Available for the first time in paperback, How I Became a Human Being is O’Brien’s account of his struggles to lead an independent life despite a lifelong disability. In 1955 he contracted polio and became permanently paralyzed from the neck down. O’Brien describes growing up without the use of his limbs, his adolescence struggling with physical rehabilitation and suffering the bureaucracy of hospitals and institutions, and his adult life as an independent student and writer. Despite his physical limitations, O’Brien crafts a narrative that is as rich and vivid as the life he led. Mark O’Brien was a published poet and cofounder of the Lemonade Factory, a California press that published poetry by people with disabilities. 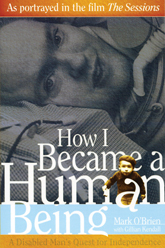 O’Brien died in 1999 at the age of forty-nine after completing a draft of How I Bec ame a Human Being. The Sessions, a film starring John Hawkes and Helen Hunt, with William H. Macy, is based on the life story of Mark O’Brien. Mark O’Brien was the subject of the 1997 Academy Award–winning documentary Breathing Lessons.